Phe.MOM.enon: Tweet Up Party and Sweet Tooth Fairy CUPCAKES! 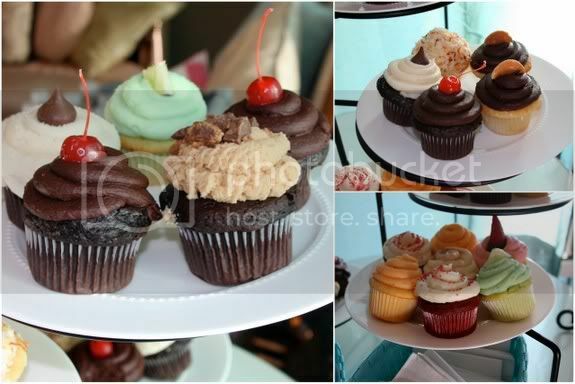 Tweet Up Party and Sweet Tooth Fairy CUPCAKES! This past Tuesday night I was lucky enough to have a really great friend who was willing to watch the boys for me while I trekked on down to Orem for a preview of the catering we will be having at the upcoming Moms Who Make It Conference - being held July 16 at Noah's in South Jordan - more about the catering soon! 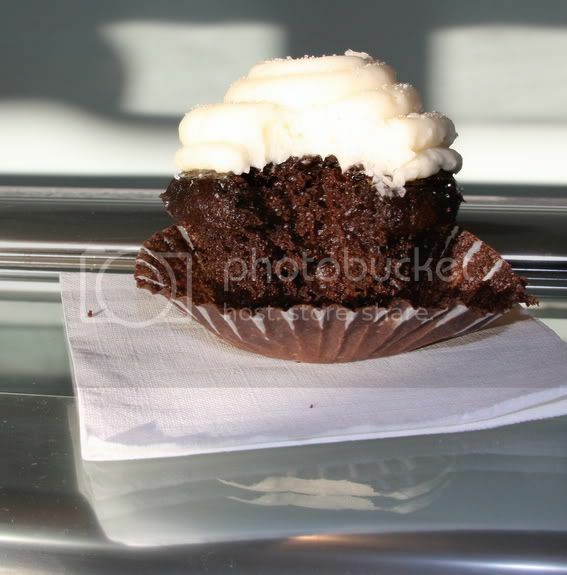 Just after the catering taste testing at Utah Celebrations Catering, we headed down to the Sweet Tooth Fairy in Provo. 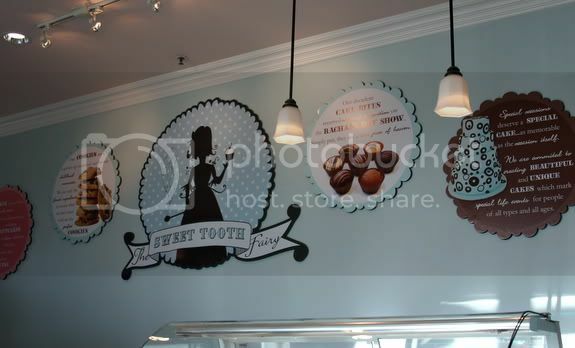 It is this adorable, comfy and yet chic bakeshop where they make cookies, cake bites, brownies, wedding cakes, and of course, cupcakes! In fact, they were even featured on Rachael Ray. All the gorgeous creations you see above were goodies that were provided for all the moms who attended this fun mom's night out. Lucky, lucky us! 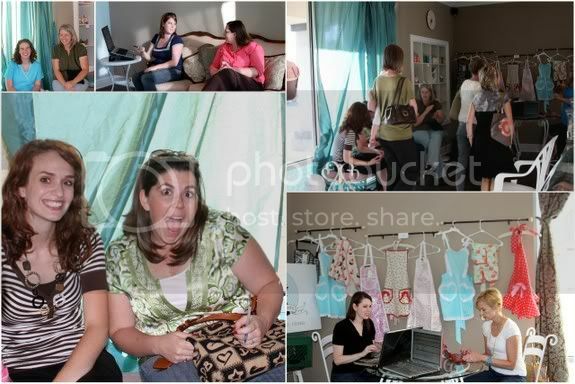 This little get together was, of course, to help promote the conference and tell more Moms all about it. We ate cupcakes, we talked, we shared stories, we laughed, we sympathized, we tweeted, and most importantly we all heard more about the inspiration behind the upcoming conference - which is basically how to be empowered and inspired to take the hard things that come our way in life, and not let them define who we are. @petit_elefant, @inevergrewup, @keepingupwmom, @sweetlifeinthe, @momswhomakeit, and of course the genius behind the event, Quinn @createdbymom as well as her product manager, Crystal. Needless to say, with this group of incredible gals, it was a blast and I was so glad I made it! This conference really isn't to be missed, and since the organizers were savvy enough to break it up into portions, for those of you that can't make it to the entire day, you can still at least join in for a part of it (though, if at all possible, you should take the day for yourself - your family will be better for it). Get Your VaNIElla Squared cupcakes! That name isn't a typo either. 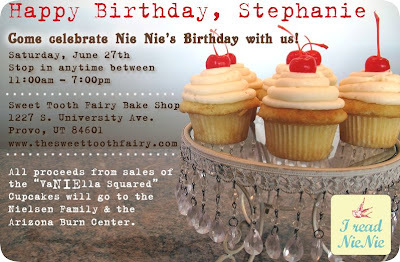 This Saturday is the one and only Nie Nie's birthday and to celebrate the Sweet Tooth Fairy is donating ALL PROCEEDS from sales of their renamed vanilla cupcakes - Nie Nie's favorite - to her family and the Arizona Burn Center. If you haven't ever read the NieNie dialogues, then you really should. When I grow up, I want to be as inspiring and wonderful as NieNie. Obviously, this cupcake was mine - you'll have to get your own! to be held in Salt Lake County on Tuesday, June 30th! Looks like MWMI is shaping up to be a pretty rockin' event! :) I wanna cupcake!! What a GREAT post...love the picture of Paige and I! We need to get some photos of you girl!! =) Next tweet up, you are going to get in front of the camera instead of behind it. How fun! Wish I was in Utah County right now! Sigh. Great photos. Yum to the cupcakes! What a fun time! Looks like a fun group of friends.